HA NOI (VNS)— Both defending V.League 1 champions Becamex Binh Duong and runners-up Ha Noi T&T hope to take the trophy home at the Eximbank National Cup, which will be held in the southern province of Binh Duong today. 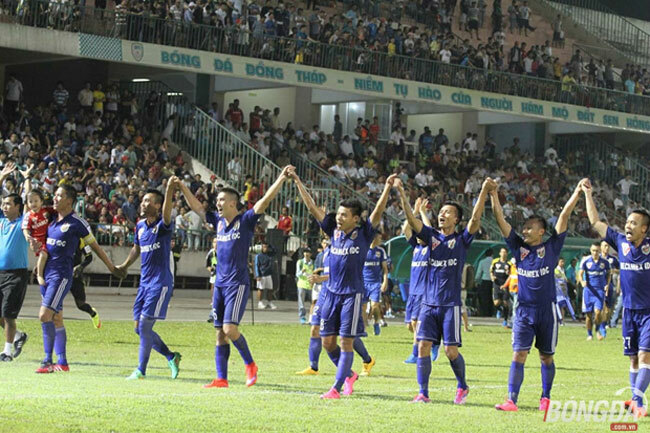 Binh Duong are first Vietnamese team to win the national premier league four times, while Ha Noi T&T have won twice. But neither have won the National Cup yet. "This will be a very interesting match, as these two teams have the best formations," said Ha Noi T&T coach Phan Thanh Hung. "The two sides have never raised the Cup so teams are thirsty for it. This is the match for my team to show our skill and spirit. We hunger for that Cup." Hung said he isn't worried about the coming match. His team have had nearly two weeks to familiarise themselves with the weather in the south. "Binh Duong have the advantage of playing on their home turf. However, with full experience, the visitors Ha Noi are not afraid of that. In my opinion, the chances for either team are 50-50," Hung added. Ha Noi T&T midfielder Pham Thanh Luong said they would try their best to beat the hosts Binh Duong today. "Binh Duong are a strong team with many national footballers," Luong said. "It would not be easy to beat two-time consecutive champions, but Ha Noi T&T have detailed plan to crush their rival in the final." At the top flight event, which wrapped up on September 20, Ha Noi T&T played unsuccessfully in the first leg, but they performed impressively in the second leg to finish second in the rankings. "Binh Duong are strong but Ha Noi T&T aren't weak, Luong added. "I believe my team will take the trophy for the first time." Meanwhile, Binh Duong attempt to wrap up a remarkable league and cup double. They were defeated in last year's National Cup final 2-0 at the hands of Hai Phong. "The team's goal is to win one more title to close a memorable football season," said striker Le Cong Vinh of Binh Duong. "Ha Noi T&T have very good fitness. It is a difficult task for Binh Duong, but my teammates and I are determined to take the Cup."